For the last few posts we’ve explored both the create and edit details of the new AutoCAD Civil 3D 2018.1 Rehabilitation and Cross Slope Optimization subassemblies and the related Rehab Corridor tools. The new Civil 3D 2018.1 concept of dynamic Rehab Assemblies controlled in the Rehab Parameters box and the Rehab Section Editor tools certainly give us new skills to learn. Autodesk has a scheduled technical webinar on the new Rehab tools tomorrow. You can sign up here. I will post a link to the recorded webinar here when that is available. Someone will probably ask a Flapping details question. Say what? Maybe it’s no surprise to you by now that the new Rehab Cross Slope Optimization subassemblies have a lot in common with the old classic stock OverlayMillAndLevel subassemblies. The new interface and reporting tool doesn’t recognize the older Overlay Rehab subassemblies but the property collections of the subs are obviously related. Did you notice Autodesk also renamed the old Rehab collection to Overlay in the on-line Help files? I did a bunch of testing producing: Rehab Corridors from Civil 3D Survey; Civil 3D Rehab Corridor Creation Details; the Civil 3D Rehab Corridor Creation Details, and the remaining posts. See all the links at the bottom of the page. The new Rehab Corridor interface doesn’t clearly communicate which dynamic Assembly you are editing. This is annoying. If the Rehab Region name updates properly, you have some idea. Sadly, you are not guaranteed this will always be the case. If your Rehab corridor is simple – aka - you have only one or two Regions, this isn’t a big deal. If your Rehab corridor contains a lot of similar but different Regions and dynamic Rehab Assemblies with similar and different Rehab Parameters, the lack of current Assembly feedback becomes problematic. We’ll tackle these more Complex Rehab Corridors in another upcoming post and video. As usual with many Civil 3D design tools, there are on create settings and properties you can change later. We need to pay attention that the appropriate details for each Region update or not. We need to better understand the mission critical Ideal Cross Slope parameter and it’s important relationship to the Rehab subassembly’s somewhat buried Slope evaluation method. Why that isn’t exposed in the Rehab Parameters box is beyond me. Oh. I get it. Your dynamic Rehab Assembly can potentially include more than one new Rehab subassembly with different Rehab Cross Slope Evaluation methods. Whoa! Better not try that. Let’s take a look at the new Rehab Cross Slope Evaluation controls at work with some example Survey built data directly from the Framework for Civil 3D’s supplied project data set. What do you know? 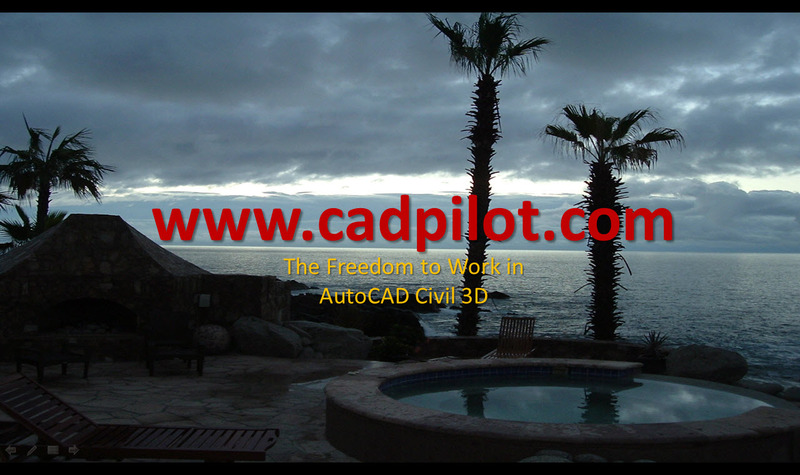 The famous Framework Civil 3D Style tools from the Civil 3D templates make all the design, QAQC, and publish details clearer albeit with the minor Code Set Style adjustments covered in earlier videos. We employ a Framework for Civil 3D example project surface in the video that allows us to see clearly at the effect of the Rehab Cross Slope Optimization evaluation methods, the Ideal Cross Slope, and the other Cross Slope Control parameters. We start with a simple but realistic Rehab Mill and Overlay solution and a review of the Survey data. Then move on to explore the wilder Civil 3D Upside Down alternatives including Superelevation. Flapping apparently reduces the absolute difference between sampled Frequency sections in the corridor for the subassembly. The Rehab Cross Slope Optimization subassemblies additions to the Civil 3D 2018 help file are technically explicit. As usual they far from explanatory or helpful in the intuitive and human sense. I have yet to find a discussion in the help on the Flapping methods and algorithm. RTM on the subs even if you don’t initially understand a word. Reading the words and terms will help your brain attach better meaning as you learn from experience using the tools. We need more than only Crown Down. The current implementations of the Rehab subassemblies really don’t support positive Ideal Cross Slope values and results. This situation is pretty common in the real world. For example - rehabbing intersections. A common project in public works departments. I wish the new Rehab subassemblies would allow you to Flip the primary horizontal and vertical control and cross slope evaluation. In other words, work from the outside horizontal control to an inside horizontal and vertical profile control instead of only inside out. Here’s my edge of pavement or cut line. Go to this Alignment and Profile pair and produce the Cross Slope Optimization results from there to here. Basically, a Flip on the subassembly changes how the initial targeting is applied. Ok. Autodesk could also produce another set of Curb up versions of the subs. Fear not. We can still work around the issue with the creative use of Regions and targeting. It’s just more of a hassle than it should be.